1. Make a Pinterest board of quilting that inspires you. Having something to aspire to motivates us to improve. Collect images of quilting that makes you say "WOW!" Don't worry if it looks too hard. 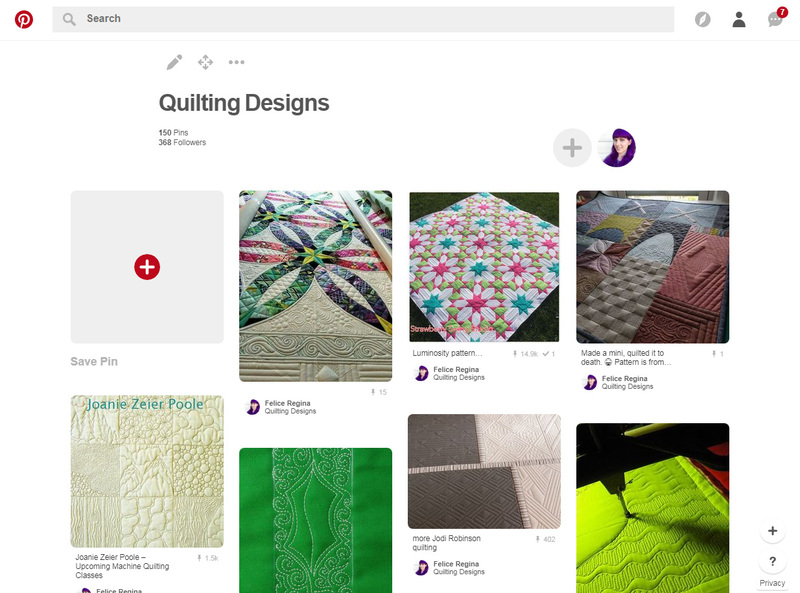 I browse my quilting board frequently to get ideas and psych myself up. 2. Commit to investing more time on each project. Good quilting takes time. I used to be dead set on getting quilting done in a day because I'm impatient. Now I take at least three or four days for FMQ. A few have taken nearly a week. 3. Experiment on a coloring sheet. I like making a few photocopies of my quilt as a simple line drawing and start doodling on it with pencil. When I'm not being distracted by the colors and fabrics, it's easier to see the shapes I want to create with my quilting. 4. Test designs with template plastic and a dry erase marker. I place a piece of clear template plastic over my quilt and draw on it with a fine point dry erase marker to get a rough idea of what a design will look like at 100% scale. Sometimes things look good on a small printout, but become impractical at actual size. Additionally, I practice drawing quilting motifs on a dry erase board. Practice makes perfect. If you draw a design over and over, the movements become instinctive. 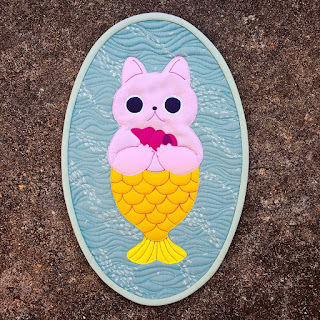 Custom quilting isn't as hard as it looks. Everything can be broken down into easy, manageable steps. For my Orbital quilt, I approached the negative space with this process: Stitch the curved cross shape about 3/8" from the seams. Mark the second curve using a plastic template and chalk (see tip 8) and stitch it. Next, stitch 1/4" inside of that shape. Fill in the wide section with ribbon candy, curve by curve. Stitch the "ribs" in each quadrant of the center. Probably the hardest part of it all was keeping my ribbon candy even. 6. Don't baste until you have a plan. I try to form at least a general idea of my quilting plan before I pin baste my quilt. Nothing is more annoying than pins sitting right in the middle of your path. If I have a plan, I can pin in places that I know will pose fewer interruptions. 7. For straight lines, look at your destination, not the needle. Magic trick time. Get a piece of paper and try to draw a 6"-ish straight line without picking up your pen. It's probably not too straight. Now mark two dots about 6" apart. Starting with your pen on the first dot, look only at the second dot. Don't look anywhere but that dot. Now draw a line connecting the dots, never looking away from the destination dot. It's a lot straighter right?! Our brains are cool that way. If you look at the destination, your body is really good at getting you there. The same works for quilting. When starting out on a quilt, I usually need to mark some things until I get the hang of the quilting. I use a ruler and a hera to mark straight lines and tailor's chalk for curved lines. For dots, I use a Frixion pen. If there is a particular curve I'm going to have to quilt over and over, I'll make a template from cardstock or template plastic as a guide when marking with chalk. If I get comfortable after a while, I can set the training wheels aside, but there's nothing wrong with using them for the whole project. Finding your favorite notions makes starting a project less intimidating. For me, I love Aurifil Monofilament, so I rarely have to worry about thread choices. I recently feel in love with Superior Threads topstitch needles (size 12) for FMQ at a friend's recommendation. My go-to batting is Quilter's Dream 80/20 blend or Dream Wool. I've also changed my mind on the Supreme Slider and come to appreciate the extra help it provides on large quilts. 10. Know when it's time for a break. Classic "me" advice. When I get tired/bored/impatient, I make dumb choices. My work gets sloppy. Being able to tell myself, "just walk away NOW" has made the single biggest improvement in my FMQ work. Maybe the break will be an hour, or a few days. Either way, being impatient and frustrated will do nothing positive for your quilting. When I was picking thread colors to quilt projects for my new collection, Caturday, I discovered a happy accident. Lots of the thread colors from my Luna Sol Aurifil thread set were great matches for Caturday! When I dumped all the new rolls of fabric into my storage pin, it clicked. The two collections blend together almost seamlessly to create a bright and happy color spectrum! Awww yiss. I pre-ordered the Tula Nova EPP kit from Paper Pieces while at Quilt Market in St. Louis, and received it in early June, eager to get started. Time for a Luna Sol and Caturday mashup of legendary greatness! I spent some time studying the original quilt and mimicked the color placement in my coloring sheet, taking notes on which prints I planned to use. The ring of striped pentagons dug its claws in my brain and I had to replicate it. Thankfully, my buddy Rebecca Bryan's new collection Panache had four stripe prints that were perfect colors for this project. I had to improvise for the yellow stripe by piecing the fabric myself from Kona Buttercup and Yarrow. 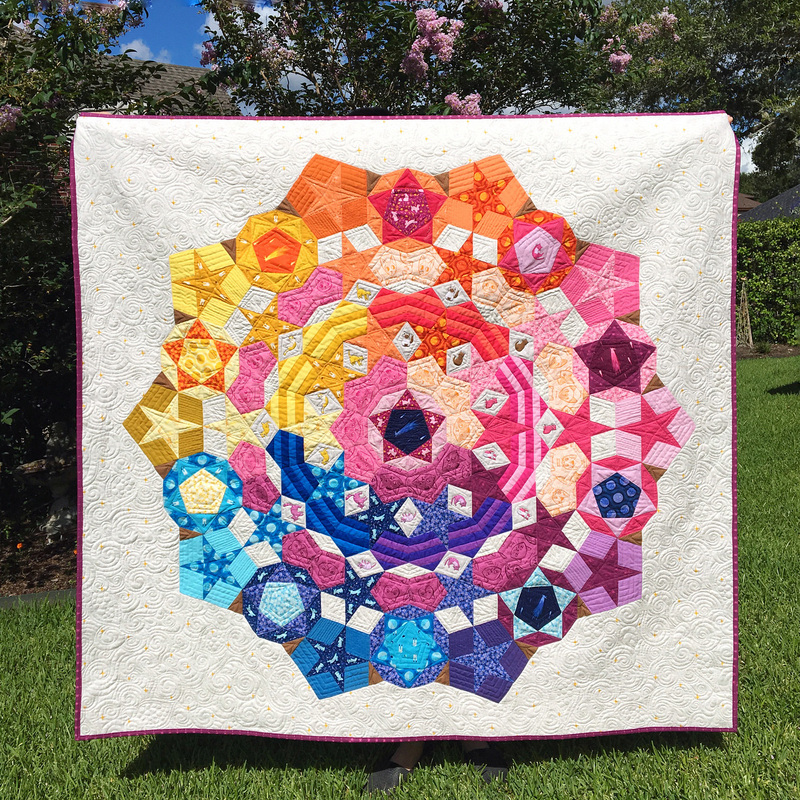 For the diamonds on the outermost pentagons, I used a selection of Windham Artisan cottons and a few other random Kona shades. Once the whole thing was pieced, I had to figure out how to applique this giant onto the background. The pattern suggests basting it before appliqueing, but doesn't get more detailed than that. I put on my thinking cap and came up with a solution that worked insanely well. I've detailed my process below. Take note however, I thread basted all of pieces. If you're a glue baster, this approach won't work quite the same. Remove all the paper pieces except for those along the outermost edge. Press the entire EPP monster with a hot iron and spray starch until it is entirely flat and smooth. Give the outermost edges an extra press. Lay out background fabric and tape to the ground as if basting a quilt sandwich, making sure it's smooth and taut. Lay applique on top, position as desired, and smooth it out. Pin baste, starting at the center and working out radially. Do not basted the outermost edge because these pieces still have paper in them. Instead, pin as close to them as you can on the pieces without paper. Your outermost edge will be unbasted. Select a thread to match your applique (I used Aurifil monofilament on top) and set your machine to a blanket stitch. Remove the thread basting on a small section of the outermost edge and remove the paper pieces. I worked "block" (the star-in-pentagon units or fat star units) by block. With the papers removed from one block, pin the loose outer edge down with a straight pin or two. 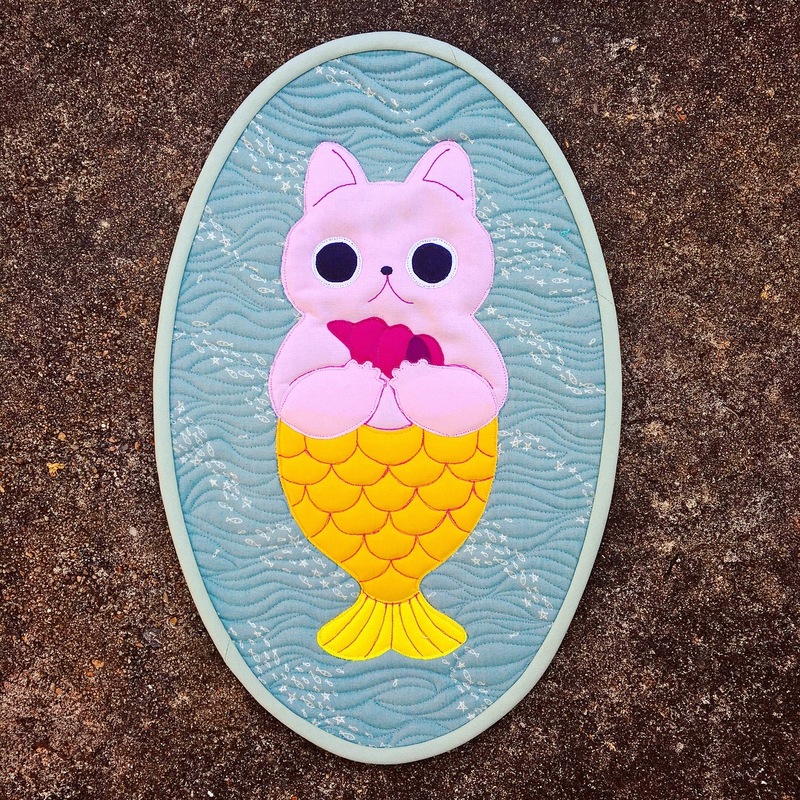 Begin stitching the applique down with the blanket stitch. When you reach any dog ears/seam allowances that stick out, simply fold them under the applique. I used my Purple Thang for this or a pair of tweezers for stubborn dog ears. Proceed around the entire piece, removing basting and papers from the next block just before you reach it, pinning it as needed, and stitching. For the quilting, I mimicked the original quilt for the most part, making some minor changes here and there. I'm pretty impressed with how well it came out, considering I do this on a domestic machine. I can't wait to hang this up on the wall whenever we move into our own place! Caturday is set to ship to stores in October 2017. I haven't done a recap/introduction post for the collection yet because I plan to do that closer to release time, so stay tuned!